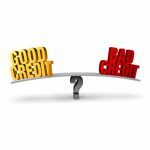 A customer with a 679 credit score recently walked away from buying a house because he could not get the best interest rate on a $100,000 mortgage. Had his score been 680, the interest rate would had been half a percent lower. The monthly payment was only $31 difference, but over 30 years it would had added up to more than $11,000.